Upstream Technologies is a fast-growing stormwater product development company on a mission to keep lakes, rivers, and oceans clean. The Client needed a form with conditional logic to drill down their needs. 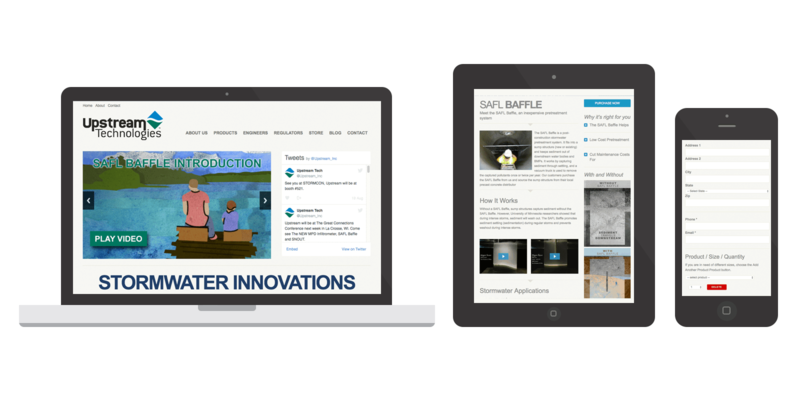 Spark Logix Studios was approached to build a website that would be useful to Engineers, Public Works and Regulators. The website is built as a responsive WordPress website and adjusts as the size of the screen adjusts. If you’re on a mobile device the text is easy to read and the layout is adapted for the screen size. Spark Logix Studios also included a robust contact form with dropdown layer attributes allowing the prospect the option to keep adding products to their selection; this process updates a total cost field. When submitted the form is then sent to the prospect and to whomever the company adds (done within the dashboard). Another great feature on the site is the video section, here a prospect is able to view several videos in succession (one after the other). Options to skip videos is accessible via the sidebar “pop-out”. This video technique is useful for training purposes, this allows the prospect to understand more detail.